Despite the traditional focus on technology and integration, the most critical phases are the initial ones: Assessment and Planning. At the heart of a website's success is the strength of the plan that governs it. Before undertaking any website plan or build, an extensive needs or business requirements assessment is necessary to identify, develop, prioritize, and document goals and current practices. It is recommended that any organization consider engaging a third-party or consultant to conduct the assessment. While the cost may be prohibitive for organizations with tight budgets, a third-party may be more successful in gathering sensitive opinions and feedback as a third-party, unlike stakeholders, have no personal attachment or stake in the website and do not have any political agendas. Armed with the acquired data and knowledge, a detailed strategic blueprint – including creative, information architecture, and ROI plans – can be crafted to build a leading edge site. 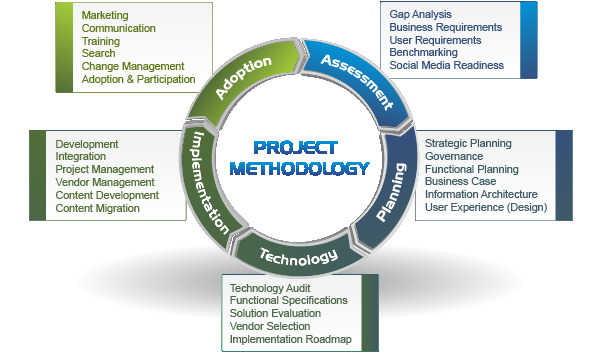 Individual modules in the Assessment Phase may include Stakeholder Engagement, User Research Review, User Survey, User Focus Groups, Benchmarking (sometimes conducted in the Planning Phase) and the delivery of the Key Findings Report. This stage is unquestionably essential to the site’s future success as it provides the strategic direction for building, governing/managing and measuring the site/portal after the launch. The strategic plan provides the high-level direction including the mission and vision of the planned portal. It also determines the goals and the critical success indicators or benchmarks for success. To learn how Prescient can turn your website or intranet into an award-winner, please contact us directly.